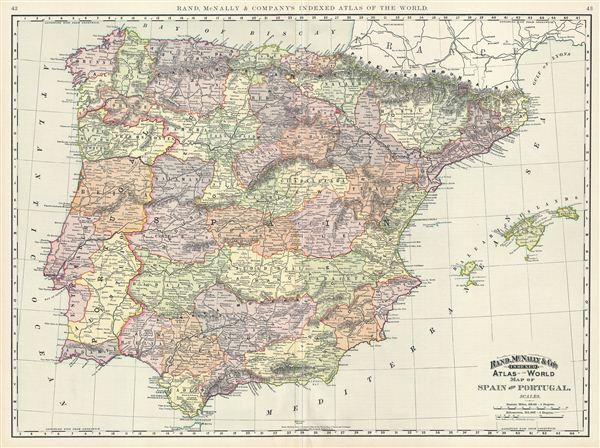 This is a beautiful example of Rand McNally and Company's 1892 map of Spain and Portugal. It covers the Iberian Peninsula from France to the Strait of Gibraltar and includes the Balearic Islands of Ibiza, Majorca, and Minorca. In a few years after this map was created, the 1898 Spanish-American War force Spain to cede the Philippine Islands, Puerto Rico and Guam to the United States, as well as relinquish sovereignty over Cuba. Color coded according to regions and territories, the map notes several towns, cities, rivers and various other topographical details with relief shown by hachure. This map was issued as plate nos. 42 and 43 in the 1895 issue of Rand McNally and Company's Indexed Atlas of the World - possibly the finest atlas Rand McNally ever issued. Very good. Minor wear along original centerfold. Text on verso. Minor verso repair, top and bottom margins. Rumsey 3565.010 (1897 edition). Philip (atlases) 1026 (1898 edition).